Remodeling your garage is a great way to improve the value of your home. You can transform what is usually a dingy, dark place that is stuffed with whatever garbage is around your house that you want out of sight into a stylish, beautiful abode that you will love. You can put in epoxy floor coatings, hang drywall and paint, and add beautiful shelving and cabinets that will get everything organized. Once you put in all that hard work and money, you should take steps to protect that space. Termites are among the most pressing dangers. Termites are common in Arizona, and they can chew through wood and cellulose quickly, damaging your walls, ceilings, beams, cabinets, and more. It’s important that you work with the right Scottsdale termite company to create a plan to create that space. Termites can cause extensive damage quickly. By the time you notice signs that you might have termites, the damage is probably already quite severe. The best thing you can do is schedule regular inspections from an experienced and highly reputable termite company. The professionals know how to find termites even if they are deep inside your walls or the wood in your home. They can detect termites even in small numbers so they can stop the colony from spreading and causing more damage. Termite control in north Scottsdale doesn’t have to wait until termites are present. Preventive treatment involves applying chemicals to the wood so that any termites that do get into the home will eat it and die. Preventive treatment should ideally be applied immediately after your remodeling is completed, but you can also have it applied after termite treatment is applied for an existing infestation. Talk to your termite company about the best preventive treatment options and when they should be applied. Make sure you keep the termites as far from your garage as possible by getting a barrier treatment, as well. The barrier treatment involves applying chemicals and baits in a perimeter around elements of your garage and the wooden pieces, such as the studs in the walls and the garage door. The barrier treatment will reach termites before they reach your garage. Adding this to the other termite treatment will enhance the protection for your garage and home. Termites are attracted to wood and organic matter like paper and cardboard. Yet many people leave piles of lumber and scraps of wood in their garage without thinking anything of it. They get done with a project and throw down the leftover bits in the pile. The problem is that the pile is like a big smorgasbord for termites. It’s like a buffet table calling out to them. And once they start chowing down on that pile of wood, they will soon start looking at the side dishes nearby, which can include your garage walls and beams. Take any wood out of your garage, even if it’s treated. Put it in an outdoor space that is not connected to your home in any way. Even living matter like plants and shrubs can attract termites to the area around your garage. Keep shrubs trimmed back, as well as branches that hang over your garage. Keep dead leaves, branches, and other organic debris away from the exterior walls of your garage. Don’t use untreated mulch or straw. In fact, xeriscaping is the best choice for areas directly next to your garage. Don’t let the remodeling work you did on your garage go to waste because termites infest the space. Work with a termite company to get regular termite inspections in north Scottsdale and develop an effective termite control plan to keep it and the rest of your house safe. 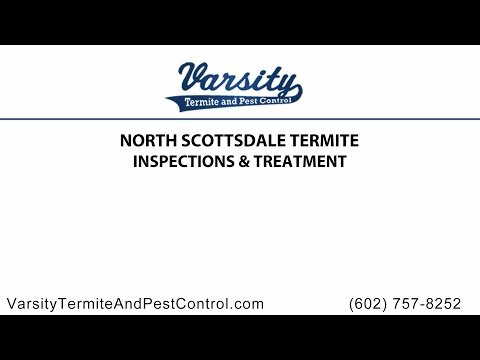 Varsity Termite and Pest Control offers comprehensive termite treatment to protect your whole home in Arizona. We offer termite inspections, pre-treatment after remodeling, treatment for ongoing protection, and eradication. Call us today to learn about your options for termite control or to schedule an inspection. We’re ready to partner with you to protect your Arizona home.